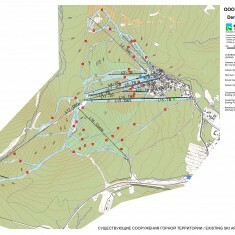 Sheregesh | Sheregesh | Ecosign Mountain Resort Planners Ltd.
Sheregesh is a ski resort located in the Tashtagol District of Kemerovo Oblast in Siberia, Russia. 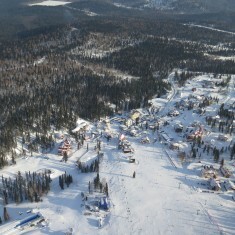 Sheregesh is Siberia’s most developed winter resort and one of the largest ski resorts in the Russian Federation. 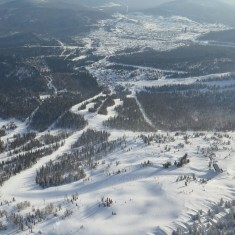 The ski area is located on the south and east side of Mount Zelyonaya (Green Mountain) and has three distinct base areas. The Sheregesh Resort base area includes day skier parking, a small commercial pedestrian street, restaurants, shops, night clubs and a number of hotels ranging in quality from two-star to four-star. There are a total of 43 existing accommodation buildings and 2,800 beds within comfortable skier walking distance to the main lifts in the Sheregeh base area. Sheregesh has 18 existing lifts with total rated capacity of 19,000 pph which can comfortably support 9,980 skiers at one time (SCC). These lifts are owned and operated by six different companies: “Cascade Lift”, “Malka”, “KemOil”, “Funsport”, “Freestyle” and “Olga”. There are 50 kilometers of pistes which cover 340 hectares of terrain. Sheregesh has an abundance of low intermediate and intermediate terrain and excellent natural powder snow conditions which has made it a very popular destination for skiers of a range of ability levels. 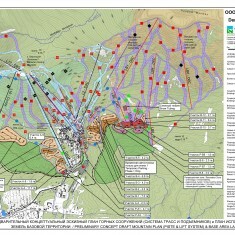 Ecosign’s Master Plan for Sheregesh includes a renovation plan for the existing ski area as well as a proposed expansion into undeveloped terrain located to the north of the existing ski area. The renovation plan for Sheregesh recommends replacing four antiquated low capacity lifts with new high speed lift systems and removing eight redundant lifts which increases the resort SCC by 1,300 to 11,280 while reducing the number of lifts by 44%. In the existing Sheregesh base area, a people mover gondola and intercept parking lot is proposed to increase base capacity, alleviate traffic congestion in the existing village zone and improve the arrival experience for day skiers. With almost no opportunity to expand the existing base area facilities, a new 3,000-bed village development and base area has been proposed to the north. An extensive expansion to ski area facilities which adds eight lifts, 800 meters of vertical and an additional 8,000 SCC is planned in conjunction with the new base area, bringing the total Sheregesh Build Out SCC to 19,260 skiers at one time.